a refined beauty studio dedicated to building the confidence of exemplary women through the artistry of makeup and brow styling. At Polished Chaos Beauty, we aim to provide an opulent environment for women to feel confident and beautiful. Through the artistry of makeup application, the strengthening of friendships through makeup classes, the amazement and beauty on your wedding day, the flickering of your lashes and the perfection of your brows, we will have you feeling the euphoria of a glamorous experience. Polished Chaos Beauty offers a bridal experience unlike any other. A day where the bride and her nearest and dearest are celebrated and pampered. A day where you are completely taken care of and your worries are swept away. 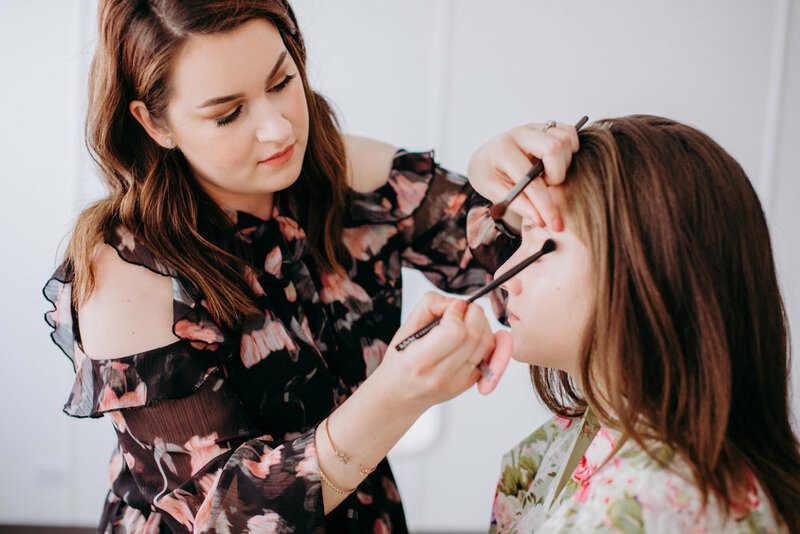 If you are attending a special event or you are having a photoshoot done, let Polished Chaos Beauty make you feel glamorous and pampered; using products that are strictly cruelty-free, we will achieve your desired look for any occasion. Are you interested in mastering a smokey-eye or perfecting your winged eyeliner? Polished Chaos Beauty offers a variety of makeup classes to help you achieve your desired look, all on your own! Classes are available in groups as well as private personalized sessions. Eyebrows are the framework of the face! Trained by celebrity brow stylist, Kelley Baker, in Los Angeles, Katie will start with a consultation to ensure your brow goals are achieved. Your brows are then shaped with wax, followed by a light temple massage and then finished with a lesson in styling! Tinting is also available. Lash Lifts are a great, low maintenance alternative to eyelash extensions. Using your natural lashes, they will be lifted into a curled position and tinted so you can say goodbye to that eyelash curler. This is the perfect solution for anyone who may react to extensions and are looking for more of a natural solution. Thoughtfully designed by Holly and Oak Design Co.